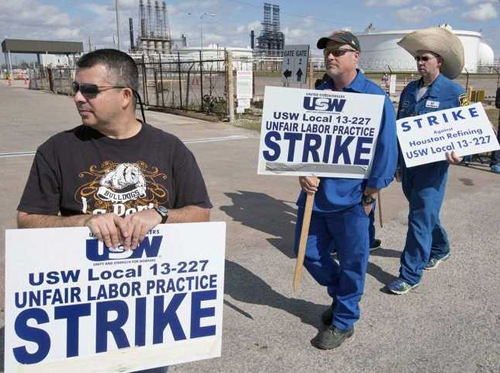 Oil Workers represented by the United Steelworkers of America have gone on strike at plants across the USA demanding better pay and benefits, and an end to the outsourcing of work at union facilities. The corporations have begun using scabs, calling them part of a "work continuation plan." The strikes began on February 1, 2015 and among other things highlight the use of "contract workers" to do union work in industries across the USA. About 3,800 oil refinery workers at nine plants in California, Texas, Kentucky and Washington state carried out their second day of strikes Monday, calling for safer working conditions and better pay and benefits. The strike comes at a routine juncture in labor relations: a contract renegotiation. But talks collapsed in acrimony Saturday night with both sides leaving the table and have not resumed yet, according to United Steel Workers International (USW), the union leading the strike. The union represents oil refinery employees in 65 plants across the United States, producing 64 percent of U.S. oil. Crude prices have fallen by 50 percent in the last six months, but analysts say the strike is unlikely to reverse that trend or to significantly diminish refining capacity. The more important effects could be related to workers� safety and the new contract they negotiate with the energy companies that employ them. �This isn�t a monumentally important development in the oil market,� said Bob Tippee, editor of trade publication Oil and Gas Journal. He said refinery owners have pledged to keep their facilities humming with the help of management and replacement contractors, so the supply won�t become much tighter and the challenge to low oil prices will be minimal. Oil prices had been high over the past few years, often topping $100 a barrel. But Lee H. Adler, a professor of labor law at the Cornell University School of Industrial Labor Relations (ILR), said the boon from high prices hadn�t been felt equally around the industry. Nor has the fall. �Despite the plummeting oil prices over the last several months, the USW�s refinery employers have done very, very well since the last national contract with workers,� Adler told Al Jazeera. But now falling oil prices � hovering around $50 � might give the union an advantage. Although the drop in prices has hurt �upstream� drillers and pumpers of oil, Tippee said refineries that turn the crude oil into something that can power cars and planes have benefited from the lower cost of crude. Although money plays a role in negotiations, the union says the strike is more about safety than pay. �This work stoppage is about onerous overtime; unsafe staffing levels; dangerous conditions the industry continues to ignore; the daily occurrences of fires, emissions, leaks and explosions that threaten local communities without the industry doing much about it,� USW Vice President Gary Beevers said in a press release. Wayne Ranick, a spokesman for the union, said that while pay increases were part of the USW�s demands, the foremost goal is safety � something he said management has not been doing enough to improve. �Do you go to work to get injured or killed? Why do you go? You want a paycheck, probably to take care of your family. People don�t go to work expecting to get injured badly,� Ranick said. He said he doubts oil industry claims that it can counter the effects of the strike with non-union replacement workers. The USW is keeping its options open � and that includes possibly expanding the strike beyond the nine plants so far involved, Ranick said. He added that safety concerns should extend beyond workers to the public, saying recent explosions and accidents have endangered people who live near refineries. He pointed to a 2005 accident that killed 15 workers in Texas City, Texas. Another refinery fire at a refinery near San Francisco in 2012 sent thousands of residents to the hospital reporting respiratory problems. �Nobody wants a big industrial accident in their neighborhood,� he said. Three articles on the USW strike of oil workers at nine different refineries. This is the first big strike of oil workers in thirty years. One U.S. refinery is shutting while management takes control of operations at six others after union workers walked out of the plants in the biggest strike since 1980. The United Steelworkers union that represents employees at more than 200 refineries, terminals, pipelines and chemical plants stopped work Sunday at nine sites, accounting for 10 percent of the country�s refining capacity, after contract negotiations fell apart. The union rejected five offers made by Royal Dutch Shell Plc on behalf of companies including Exxon Mobil Corp. and Chevron Corp. since talks began Jan. 21. Tesoro Corp. is shutting half of its 166,000-barrel-a-day Martinez plant in California that wasn�t already idled for maintenance. Union leaders haven�t called a strike nationally since 1980, when a stoppage lasted three months. While only one of the nine plants has curbed production amid the stoppage, a full walkout of USW workers would threaten to disrupt as much as 64 percent of U.S. fuel output. Shell and union officials began negotiations amid the biggest collapse in oil prices since 2008. The USW has been asking employers for pay increases, stronger rules to prevent fatigue and measures to keep union workers rather than contract employees on the job, Lynne Hancock, a union spokeswoman based in Nashville, Tennessee, said by phone on Monday. It�s also negotiating for better health-care benefits because workers are �paying too much� for deductibles and premiums, she said. United Steelworkers members do everything from operating units to performing maintenance to testing and analyzing samples in labs at U.S. refineries, Hancock said. The refineries on strike can produce 1.82 million barrels of fuel a day, data compiled by Bloomberg show. They span the U.S., from Tesoro�s plants in Martinez and Carson, California; and Anacortes, Washington, to Marathon Petroleum Corp.�s Catlettsburg complex in Kentucky to three sites in Texas, according to the USW�s statement. In Texas, Shell�s Deer Park complex, Marathon�s Galveston Bay plant and LyondellBasell Industries NV�s Houston facility are affected, according to the union. LyondellBasell activated its work-continuation plan, according to spokesman George Smalley on Sunday. U.S. benchmark West Texas Intermediate oil rose $1.33, or 2.8 percent, to settle at $49.57 a barrel on the New York Mercantile Exchange on Monday, erasing an earlier decline. Gasoline for March delivery rose 4.5 percent to $1.5446 a gallon, and the diesel contract for the same month gained 3.3 percent to $1.7575. Brandon Daniels, a spokesman for Marathon, confirmed work stoppages at its Catlettsburg refinery and Galveston Bay plant and said the company �has plans in place to ensure the continued safe operation.� The walkout also includes Marathon�s Houston Green cogeneration plant in Texas and Shell�s Deer Park chemical plant. At Marathon�s 451,000-barrel-a-day Galveston Bay refinery, which the company bought from BP Plc in 2013, as many as 45 union workers were taking turns picketing in four-hour shifts. They wore green jackets and winter gear covering their faces, holding blue signs with �This Is An Unfair Labor Practice� scrawled across them in white lettering. David Jones, a 56-year-old pipefitter who has worked at the refinery for almost half his life, was at the union office a mile from the plant with other picketers getting his strike assignment Monday. He said many of the refinery�s supervisors have never worked its processors and other complex machinery before, or at least in many years. Tesoro is shutting process units at Martinez, Tina Barbee, a spokeswoman at the company�s headquarters in San Antonio, said by e-mail on Monday. The facility already had about half its processing capacity offline for maintenance. The company has �successfully transitioned and are operating� the Anacortes and Carson refineries, Barbee said. More refineries are standing by to join the sites on strike, according to two people familiar with the plan who asked not to be identified because the information isn�t public. Shell remained �committed to resolving our differences with USW at the negotiating table and hope to resume negotiations as early as possible,� Ray Fisher, a spokesman for The Hague, Netherlands-based company, said by e-mail on Saturday. Shell activated a �contingency� plan to continue operations at its Deer Park refinery, Fisher said. Remaining USW-represented sites are operating under rolling, 24-hour contract extensions, according to the union. Refiners� shares on the Standard & Poor�s 500 have more than doubled since the beginning of 2012, when the steelworkers last negotiated an agreement. U.S. fuel producers have been cashing in on the biggest-ever domestic oil boom, which has helped drive oil prices almost 50 percent lower in 2014. Gasoline in New York was at a premium of $15.55 a barrel to crude at Cushing, Oklahoma, the delivery point for WTI contracts. That�s the highest profit from making the motor fuel since September. �There will be a knee-jerk reaction in gasoline and diesel prices because we don�t know how long this is going to be or how extended it might be,� Carl Larry, Houston-based director of oil and gas at Frost & Sullivan, said by phone Sunday. Workers from nine refineries across the U.S. have committed to the stoppage and, so far, the strike has caused one refinery to suspend its operations�the Tesoro Martinez Refinery in Martinez, California. The strike has been called at five Texas-based refineries, two California sites, and one each in Kentucky and Washington state. "Oil refinery workers are in the front line of protecting our communities against the environmental hazards of the oil industry." Steelworkers International vice president Gary Beevers, who heads the union�s National Oil Bargaining Program, said that the stoppage is in part to protect workers and communities from the "dangerous conditions the industry continues to ignore." "It's a pattern we�ve seen again and again�oil executives prioritizing their own profits over the well-being of everyone else." Beevers continued: "This work stoppage is about onerous overtime; unsafe staffing levels; dangerous conditions the industry continues to ignore; the daily occurrences of fires, emissions, leaks and explosions that threaten local communities without the industry doing much about it; the industry�s refusal to make opportunities for workers in the trade crafts; the flagrant contracting out that impacts health and safety on the job; and the erosion of our workplace, where qualified and experienced union workers are replaced by contractors when they leave or retire." "Oil companies have created conditions that endanger not only the safety and health of their own employees, but that of nearby communities," said Sierra Club executive director Michael Brune. "It's a pattern we�ve seen again and again�oil executives prioritizing their own profits over the well-being of everyone else." "We look forward to the day when energy industry workers are able to focus on safer, just, and more stable jobs in a clean energy economy and aren�t tied to the profiteering whims of big oil," said Turnbull. According to Uehlein, the plight of workers�including those employed by the oil and gas industry�should not be separate from the broader goals of those who campaign for social, economic, and climate justice. In turn, he argues, "organized labor must recognize its shared interest with those vying for a healthier planet." he said. "As we work to protect the earth from climate change, it is particularly important that we advocate for the needs of workers in fossil fuel industries whose wellbeing must not be sacrificed to the necessity to reduce greenhouse gas emissions." On Sunday, when 3,800 members of the United Steelworkers (USW) walked off their jobs at nine oil refineries across the country (including two in my home state of California), it marked the first national oil refinery strike in more than three decades, going all the way back to 1980. Congratulations, USW. With this strike, organized labor is finally showing signs of life. Although industry analysts have pointed out that gasoline prices were already edging upwards several days before the strike, everyone is going to blame the union for any rise in gas pump prices. And why wouldn't they? Unions make excellent scapegoats. Indeed, with the strike only a couple of days old, expect the oil companies to seize this opportunity to raise prices disproportionately. But the facts tell a different story. Looking back to 1980, the year of the last national refinery strike, Phil Flynn, an analyst with the Price Futures Group, noted that even though that strike lasted a whopping three months, it had little effect on gasoline prices. According to Flynn, it raised prices only "a couple of pennies at best." The USW called this current strike after rejecting five substandard proposals (the union described the final offer as "insulting") from Royal Dutch Shell, the company acting as lead negotiator for the oil industry. In a strategic move, the USW's walkout targeted specific facilities. Among them are the Tesoro Corporation, Exxon Mobil, Marathon Petroleum, and LyondellBasell Industries, facilities stretching from California to Texas and Kentucky. Aware that the oil companies and media will try to portray these union members as greedy bastards, USW spokeswoman Lynne Hancock made it clear that, while hourly wages are a component of these negotiations (as they have been in virtually every contract negotiation in every industry in history), they are not central to the bargain. This shutdown isn't about hourly pay. "Wages are not a part of this walkout whatsoever," she said. Among the issues central to the strike are mandatory employee contributions to medical insurance, continued reductions in headcount (leading to lower staffing, longer hours and more fatigue), and the company's refusal to take seriously the union's request that the membership be trained for jobs that are increasingly being performed by outside contractors. This outside-contractor issue has become a huge deal to unions everywhere. And when it reaches critical mass, it's going to become a huge deal to non-union workers as well. Based on what's occurring in the marketplace, it's the dream of every company to change the status of their workers from "employee" to "independent contractor," thereby allowing them not to have to pay for insurance, pensions, vacations or holidays. Once your employees become classified as contractors, all you have to do is give them cash for doing the job. Write them a paycheck and be done with it. And because there's almost always going to be a surplus of workers, market forces are going to constantly drive wages downward. But even on those occasions when employers are required to pay top dollar for workers, the savings in benefits and administrative costs is going to be enormous, which is why the move toward "de-categorizing" employees has become so popular. No matter how this USW strike turns out, one hopes it sheds light on what's become a dangerous trend. The notion of loyal employees retiring after working 30 years for the same company is an anachronism. Companies don't want loyalty. They want flexibility. And what they can't get from contractors they'll try and get from robots. It ain't a pretty picture. David Macaray, a playwright and author (It's Never Been Easy: Essays on Modern Labor [Second Edition]), is a former union rep. He can be reached at dmacaray@gmail.com.